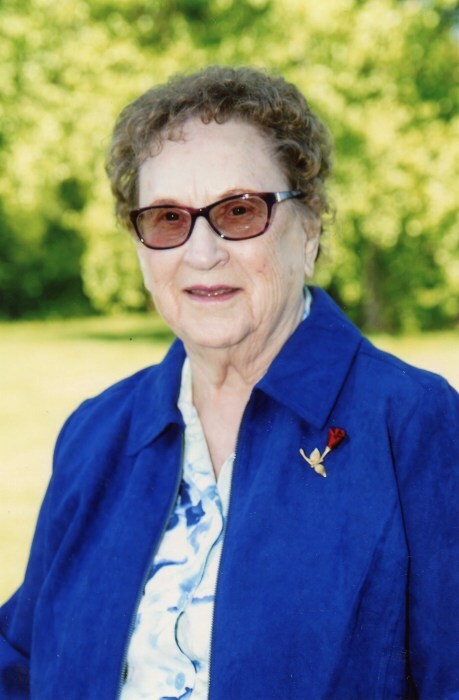 Velma Kuseske, age 91, of Villard, MN, died Sunday, December 2, 2018, at her home. Funeral services will be held at 11:00 A.M. on Saturday, December 8th at St. John’s Lutheran Church in Villard, with Pastor Philip Beyersdorf officiating. Visitation will be from 5:00 - 7:00 P.M. on Friday evening at the Hoplin-Hitchcock Funeral Home in Glenwood, and will continue on Saturday morning at the church, one hour prior to the service. Interment will be in Lake Amelia Cemetery, Villard. Arrangements are with Hoplin-Hitchcock Funeral Home of Glenwood. Velma Auguste Kuseske, the daughter of Fredrick and Ethel (Schwanke) Fischer was born October 16, 1927 in Fair Haven Township, Stearns County, Minnesota. She grew up on a farm in rural Kimball where she was baptized on November 24, 1927 and later confirmed March 29, 1942. She graduated from Kimball High School in 1944. Velma was united in marriage to Ervin Kuseske on August 8, 1944 in Fort Polk, Louisiana, while Ervin was serving in the Army. After his military service, Velma and Ervin made their home on a farm southeast of Villard where the couple farmed and raised their daughter and three sons. Velma and Ervin shared 63 year of marriage before Ervin passed away February 1, 2008. Along with being a loving homemaker and helping on the farm, Velma worked a number of years in manufacturing and as a nursing assistant. She was a member of St. John’s Lutheran Church in Villard, the Villard Legion Auxiliary, Villard Senior Citizens, North Side Birthday Club, Pope County Seniors Coordinating Board and LWML. She enjoyed quilting, flower gardening and scrapbooking. She especially loved her children, grandchildren, and great-grandchildren. Velma is survived by her sons, Allan (Kathleen) Kuseske of Villard and Randy (Pokcha) Kuseske of Rochester; daughter-in-law, Susan Kuseske of Villard; grandchildren: Mark (Jen) Kuseske, Cheryl (Dave) Gebhardt, Brian Kuseske, Allan II (Tina) Kuseske, Dawn (Brad) Wampole, Jane (Casey) Allan, Adam (Cindy) Kuseske, Aaron (Jessie) Kuseske, Nathan (Carrie) Kuseske, Jesse Kuseske, and Andrea (Ken) Kuseske; 14 great-grandchildren; brother, Lenis Fischer; sister, Darlene Fisher; nieces, nephews, other relatives and friends. She was preceded in death by her parents; husband, Ervin; daughter, RoxAnn and son, Larry.